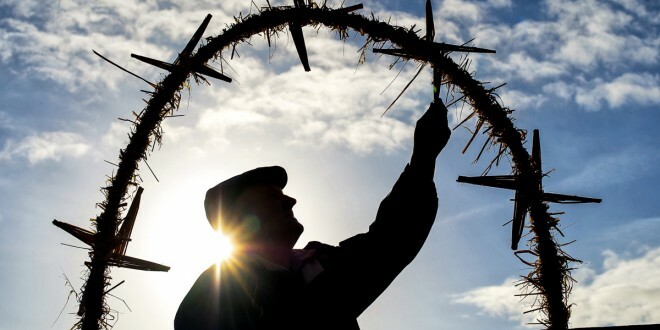 Heaven And Earth...Michael Egan of Spanish Point examines the traditional crosses made from straw into an archway over the entrance during the annual celebrations at St Bridget's Well, Liscannor last Sunday. Photograph by John Kelly. Clare County Council is encouraging people to make submissions to Ireland’s National Inventory of Intangible Cultural Heritage, launched by Department of Culture, Heritage and the Gaeltacht. Once compiled, the Inventory will acknowledge and promote Ireland’s living culture through official State recognition. In tandem with this, it will fulfil Ireland’s obligations under the 2003 UNESCO Convention for the Safeguarding of the Intangible Cultural Heritage, which Ireland signed up to in December 2015 to raise awareness of, and respect for, our unique living culture.